Create an enormous “universe of stars” that will “wow” you! 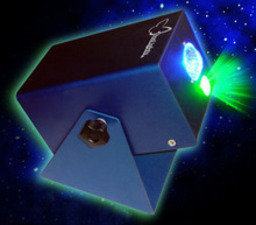 Watch thousands of moving pin-points of green light dance in pattern on a soft blue nebula cloud. Very easy to setup, just plug it in and point it on a wall, ceiling or dance floor. Brightness knob controls the brightness of the blue nebula cloud. Covers about a 25 x 25 foot area.